Fifteen Days without a head was one of those books that I read without really knowing what it was about and without any expectations about what it had it store for. I was blown away by it and loved reading each and every page and am looking forward to reading more of the author's work in the future. If I had to compare this book to anything else out there I would say the closest comparison is Phil Earle's Being Billy because while the storylines were different they had the same feel about them as they are both about a teenage boy living on the edge of the system trying to find his way in the world. I loved the main character in this book just a little bit too much. From the first moment I met Laurence I wanted to pick him up and take him home and mother him far too much. Despite being only 15 he has taken the weight of the world on his shoulders taking care of his mum (and her drinking problem) and his younger brother. It all gets all that bit more complicated when his mum suddenly disappears and suddenly Laurence has to deal with the household on his own without any income coming in it feed himself or his younger brother. What really resonated with me in this book was the feeling of sheer hopelessness he was dealing with and how some people in positions of authority who should have been helping really weren't. Not because they disliked Laurence but more because they didn't have time to listen to him properly and take the time to understand why he was struggling as he was. The scene with his head of year really stuck with me as the teacher had his obligatory "chat" about Laurence being late but didn't take the time to really see the wider picture which really made Laurence's life even more difficult than it already was. What I also loved about this book was the relationship between the two brothers and how mature Laurence was towards J and how he went out of his way to give J the childhood he himself had missed out on. 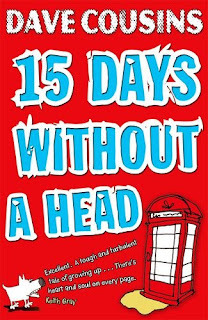 The book was also fantastic at contrasting the awfulness of the Roach boys' day to day existence with some brilliantly funny passages which kept me giggling throughout the entire book. A new author to watch out for and a fantastic debut novel. So glad you loved it too. Dave is going to go far with this amazing debut. I definitely need to get hold of this one. It sounds brilliant and your view is awesome! I only sort of skimmed your review, as I am quite desperate to read this one. It sounds fab!